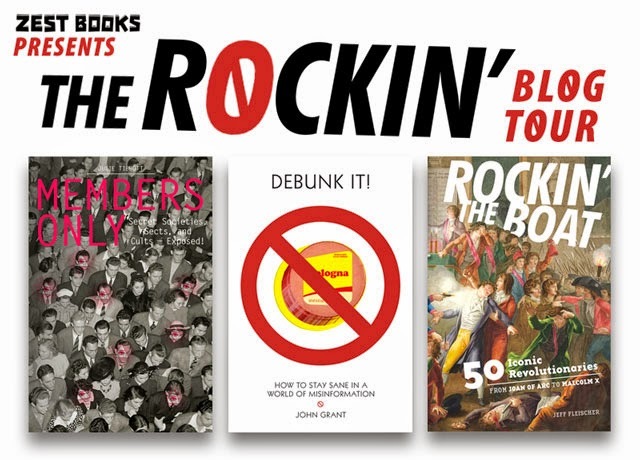 ROCKIN' THE BOAT: 50 ICONIC REVOLUTIONARIES FROM JOAN OF ARC TO MALCOM X wisely focuses on political revolutionaries. Or, as the introduction puts it, "everyone here made their biggest impact by influencing (or trying to influence) who was in charge of their homeland or how those in charge treated their people." Even when you eliminate art, science, and other revolutionaries, it is still a large field to cover. The fifty people covered in ROCKIN' THE BOAT are profiled in chronological order (from birth year), from Hannibal Barca to Martin Luther King, Jr. The revolutionaries cover all six inhabited continents, and many women are represented, from Cleopatra to Emma Goldman. Fans of Maggie Stiefvater's The Raven Cycle will get a kick out of the inclusion of Owain Glyndwr. I may be an adult, but I still found that some of these iconic revolutionaries were new to me, such as Hone Heke, a Maori leader. I know very little about New Zealand, aside from some vague knowledge about its colonization. Those four pages gave me much more detail than I already had, plus names of wars, battles, people, and places to let me search for more. I think ROCKIN' THE BOAT is a decent introduction to a variety of historical figures. I like that journalist and author Jeff Fleischer included people regarded by history as villains as well as those regarded as heroes. It helps provide a more balanced view, and invites us to question the division between the perceptions. I wish it had a bit more depth, but the variety of the people profiles helps make up for it. It might not have anything new for fans of revolts through the ages, but I'm not sure there are a ton of those hanging around. Thanks to Zest Books, I have one copy to give away. Come back later today for an interview with the author.